Even the most blasé person with the mildest of interest in Lizzie Borden and the famous unsolved case will perk up when Lizzie’s house on the hill, Maplecroft is mentioned. 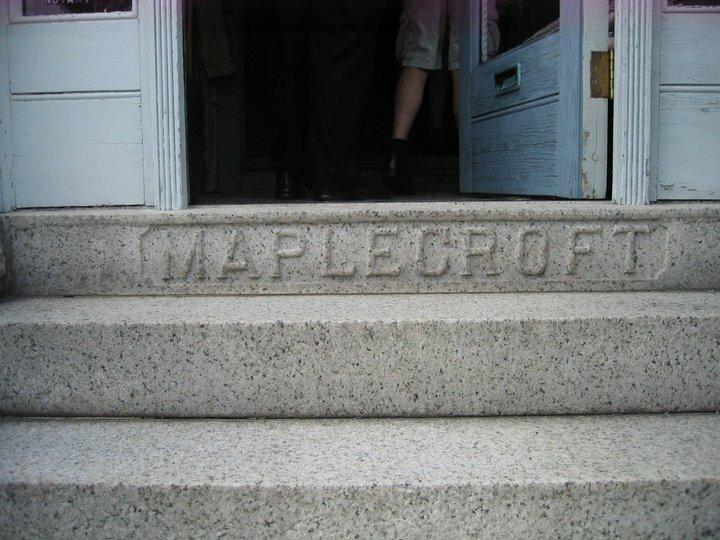 For it is Maplecroft where Lizzie would pass the remainder of her life after her acquittal, from age 33 until she died there in June of 1927. Was it in fact a prison, was she a bird in a gilded cage? Did she ever find any peace and happiness in her”marble halls”. 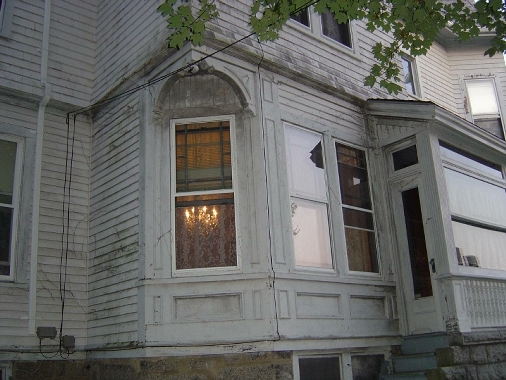 After she and Emma moved into the house, carriage drivers, for a small extra sum, would offer passengers disembarking from the train station at Bowenville a look at the dwelling place of Lizzie Borden, infamous accused hatchet slayer. 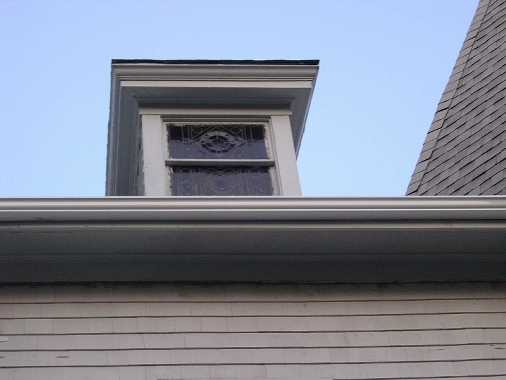 How many must have peered up at her second story front window, hoping for a glimpse? How many dared to sing a snippet of the famous 40 whacks ditty? What did she think and feel as she gazed quietly through lace curtains down French St.? Why did her sister Emma leave her? So many unanswered questions have fueled such an obsession with the house on The Hill. If Lizzie had killed Abby and Andrew Borden, was it for just such a house as Maplecroft? 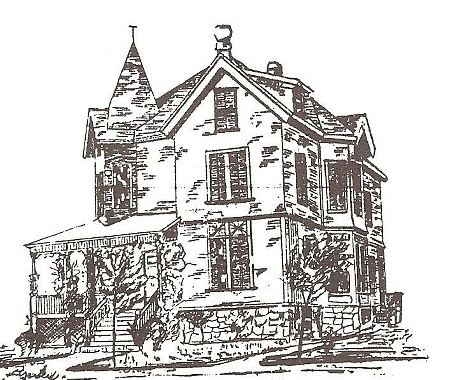 The house has seen only a handful of owners since Lizzie lived there, and has been a totally private residence for the most part, excepting for a short interval when a bed and breakfast was tried there by the current owner. 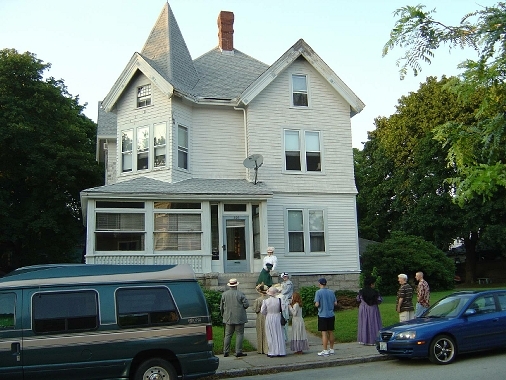 Many who stay at the Lizzie Borden Bed & Breakfast Museum make the pilgrimage to French Street on their way back from Oak Grove Cemetery, to stand and gaze, and think about Lizzie’s years there- imagining her figure standing at the window, getting into her Buick with her Boston bull terrier, sitting in the window seat on the second floor. Paranormal investigators are certain that Lizzie’s ghost must somehow still meander the halls late at night, sighing and wistful, loathe to “pass on”. 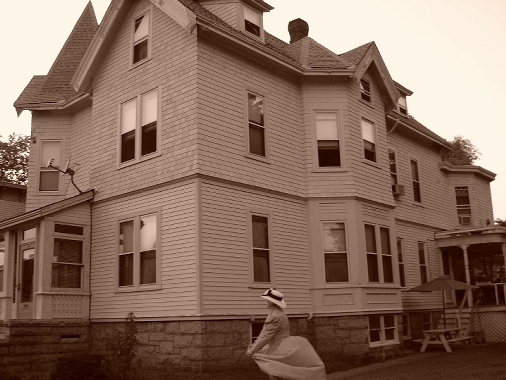 Whatever the motivation, to be invited into the shadowy interior of Maplecroft is, and always will be, a very special interlude for anyone who has ever harbored an interest in the Borden case, for to go inside Maplecroft is to get a glimpse inside Lizzie Borden. 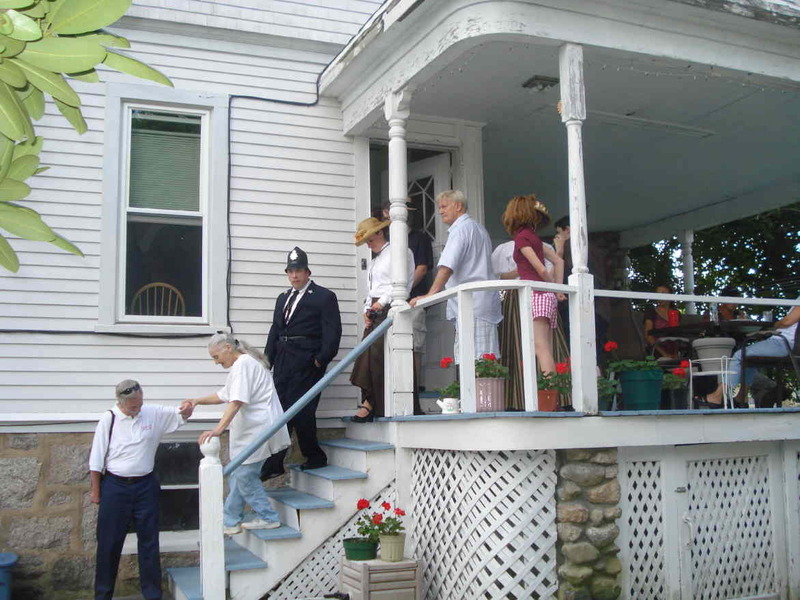 In an unexpected gesture of hospitality, the current owner, Robert Dube, invited the Pear Essential Players, cast of the August 4th re-enactments at the Borden Second St. home, to come inside Maplecroft. Last year the cast was shown the first floor, this year all three floors were on the impromptu tour- and for those new cast members, it was a thrilling opportunity. 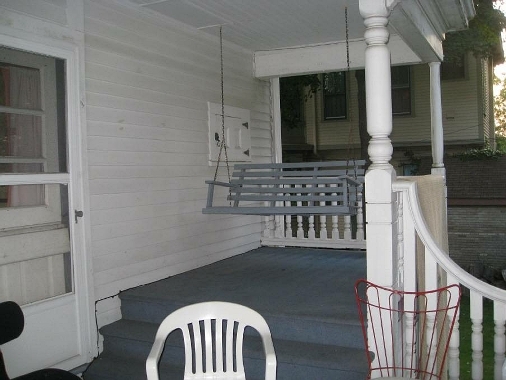 Passing through the enclosed porch, one enters through the inner doors to the large foyer. There is a carved cherry mantel over a generous fireplace in the foyer. Opposite, by the staircase newelpost is a comfortable built-in bench where one can warm cold feet near the fire. Today a large iron bull dog has pride of place near the hearth where maybe once stood Lizzie’s little terrier. The wooden floors catch the eye- golden with a trim of darker walnut as a border. A crystal chandelier hangs overhead but is not original. Most riveting is a portrait of Lizzie in an elaborate frame which hangs on the wall looking out over the front entry, just out side the curved arch of the diningroom. Lizzie had Romanesque arches installed leading into the diningroom and parlor. The parlor at one time had two entry doors but Lizzie had one to the left of the fireplace closed off to make more wall space in the parlor. Crisp reliefs of four single maple leaves in a sort of cartouche are carved in the twin posts at the end of the L-shaped foyer staircase. The woodwork is the thing many will remember, for it is exquisite throughout the home. The parlor is of a medium size. There is a grand piano there, as Lizzie had during her tenure there. Immediately upon going through the curved arch from the foyer, a carved mahogany mantel catches the eye as well as a bay window on the east side of the room. A religious oil painting from the old Central Congregational church is on the wall. The mind cannot help but travel back to the days when Nance O’Neil and her theatre friends must have enjoyed hospitality in this room. One imagines the clink of a champagne glass, the sounds of conviviality. It is good to remember that there were happy times in the house when Lizzie was mistress there. Perhaps the dining room (shown from outside below) is the loveliest still of all the rooms. Her soft blue background floral wallpaper is on the walls and features clusters of pale golden and purple grapes with pink roses and tulips which appear in each corner of the latticework diamond pattern composed of white flowers. Her original drapes have been saved although presently lace curtains let in the cool breeze coming up the hill from the Taunton River. Twin sconces hanging with prisms are on the south wall, softly illuminating the carved fireplace. The proportions are elegant, the radiators are neatly recessed into the wall, and one can imagine how charming a dinner party must have been in this room. Beneath it all, gleaming wooden floors trimmed with the darker wood inlay remind one of the workmanship which went into the building of Maplecroft. The breakfast nook off the kitchen must have been a delightful cozy space for Lizzie to take meals alone or with Emma in daily life. The outlook is on the shady west side of the house. Today it is used as a cupboard-lined storage area for the kitchen. The kitchen itself is light and airy, on the east side where it receives the golden light of the morning. The original embossed tin ceiling was restored to its former glories and is today painted a creamy white with the large old enamel sink on the south end of the kitchen. The original cabinets have been saved, although they are in storage now. They were few in number and not spacious in capacity for a modern family. Off the north end of the kitchen there is a steep staircase going up to the second and third floors. This would have been the stairs used by Lizzie’s servants. Climbing to the third floor, it is a surprise to turn left into a long room which is divided roughly in half with the wall going north-south . The east side of the third floor division is the old billiard room, the west side of the division houses bedroom and bathroom spaces for servants. Lizzie’s original gasolier lamp which hung over the billiard table has been replaced by a practical electrical one, with the original retained for future owners. Most striking of all is the stained glass which can be seen on the west façade. The colors seen from the inside are deep and vibrant. A portrait of Amanda Borden hangs near the billiard table. Of all the spaces within the sprawling home, perhaps the second floor is the most exciting to see. These are the rooms where Lizzie slept and read, and lived out her private life. These are the rooms where she dreamed, and perhaps despaired. Her closest intimates saw her there. At the top of the stairs from the first floor , taking a right and through the French doors is what has been called her “winter bedroom”. Although the famous “poem mantle” has now been replaced by a rose marble one, the original mantle, known by so many and carved with clover leaves and the poem about friends who come “trooping down the dusty ways, when my fires burn low” rests in Lizzie’s former book room. 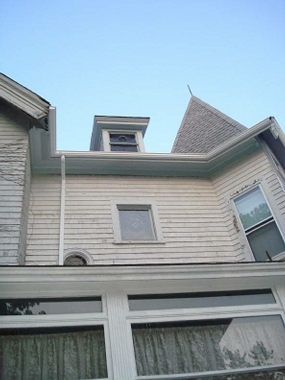 Her long, low wooden window seat still reposes in the triple window gable overlooking French St. In the floor in front of the fireplace is a brass rectangle- all that remains today of the servant call button which would ring in the kitchen when stepped upon. Above can be seen the delicate floral tracery of the white tin ceiling. The room is decorated in her color- pale blue. The mantel in the library which has “At Hame in My Ain Countrie” stands as silent sentinel to the many hours Lizzie must have luxuriated with her books in this space. The stained glass window is no longer there, but one gets a sense of the quiet seclusion the space offered. Passing through into what was once the bookroom with floor to ceiling wooden cases, one notices the ornate crown molding around the top of the ceiling which was once gold leafed. Across the hall is Emma’s room, small, rectangular and unremarkable- only somewhat larger than her old room on Second St. In the rear of the house over the kitchen is Lizzie’s summer bedroom with private ensuite bath. A raised hearth and fireplace sit in the northwest corner. In summer, with the windows open, the noises of the street would have been drowned out by the sound of wind rustling through the maple trees. Her hand painted tub is in storage and has been replaced by a vintage enamel clawfoot soaking tub. This must have been the room where, on the night before her death, Mr. Terry was called to her bedside to receive an additional bequest from her bounty. Standing in this room, one feels as if Lizzie may at any moment, walk in from the hallway to get her hat and gloves for a country drive with Mr. Terry, her terrier pattering along behind. Passing from the kitchen onto the back porch, the old iceman’s window is clearly seen, and one pictures Lizzie feeding her squirrels and birds from the generous deck of the porch. 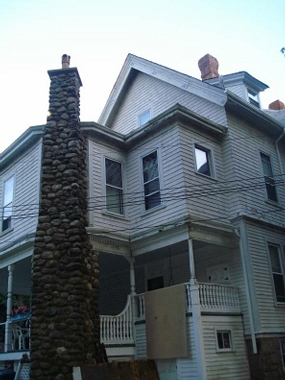 Most remarkable about the back of the house is the stout stone chimney which was built to her direction. 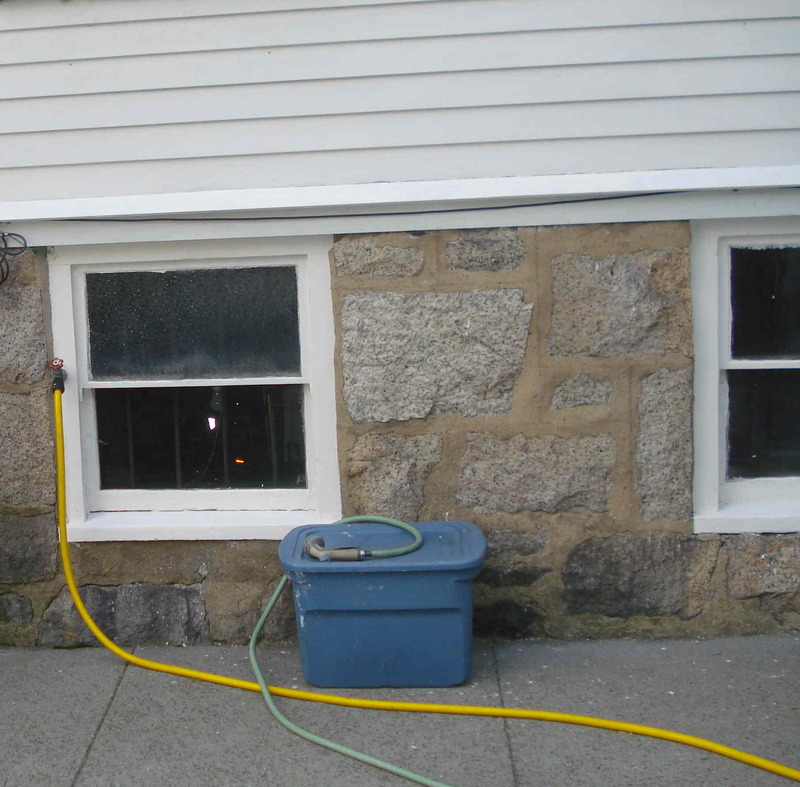 Owner Robert Dube discussing steel bars on cellar windows. If the definition of a mansion is “a large house with many rooms”, then Maplecroft is indeed a little mansion. 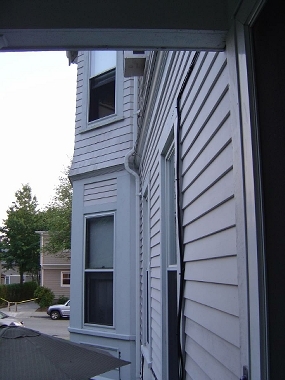 But mostly it was home to Lizzie Borden, and even today, her presence is unmistakably still there, subtle and mysterious. Out of respect for the privacy of the house owner, only exterior photographs are shown in this article. very enjoyable. I’m sorry that there isn’t one word about the first picture where the young girl is seen with her windblown dress. It’s a great photo…… so tantalizing in that it captures that tiny, fleeting moment so well. Who is she? what is she doing there? does she know lizzie ? guess we’ll never know, but i’d like to know !! I would love to see it I bet it was something in its day even now it would be beautiful. I really enjoy this site; thank you for your time & effort. I admire the effort and grace found here & am always very curious about whether she did it. From the movies & books I’ve favored, it seems the one who committed the axe murder while she was in custody may have been the one, though perhaps working on Lizzie’s behalf & in love with her. As you know, I was present when Mr. Dube repeated his gesture for us Mutton Eaters last year. Thank you for refreshing (and supplementing) my memory! Thank you for giving me a tour of Maplecroft. I read my first book in the early 1960s. I have been hooked ever sense. Loved it! How generous of Mr. Dube to allow a special tour–thank you for sharing it!! So fascinating … am just having to ask out of dire curiosity–has Mr. Dube ever had any Lizzie “experiences” (paranormal or otherwise)? If he has, he has never mentioned it. I still don’t understand why Maplecroft isn’t a B&B. I would much rather stay there for a night or two than the house on 92nd Street. Also, why hasn’t anyone ever taken the chemicals from luminal and tested the axe? Maplecroft was a B&B briefly. It is a private home and the B&B effort did not work out for them I guess. It takes a big staff to run such a business and it is not for everyone to be sure. Dr. James Starrs from George Washington University, famed forensics expert, did some testing on the hatchet head back in 1992. Of course the thing has been handled so much, stored in many places, and contaminated by so many surfaces, it would be hard to prove anything related to the 1892 crime. Im a little disappointed about there not being any interior shots. 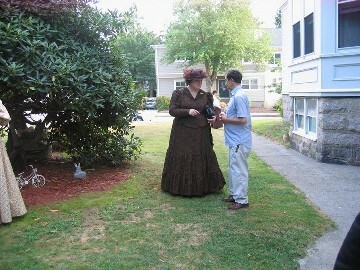 But I also must admit your respect for the Dube’s privacy, and in a sense, lizzie’s quite refreshing. thanks for the trip! Great article Shelley, as always well written & very enjoyable. Shelley…Reading this wonderful article was like visiting Maplecroft all over again. You have captured that amazing event perfectly! Yes Shelley, your prose did justice to this great event! I would like to thank you for this informative site. I enjoy it. 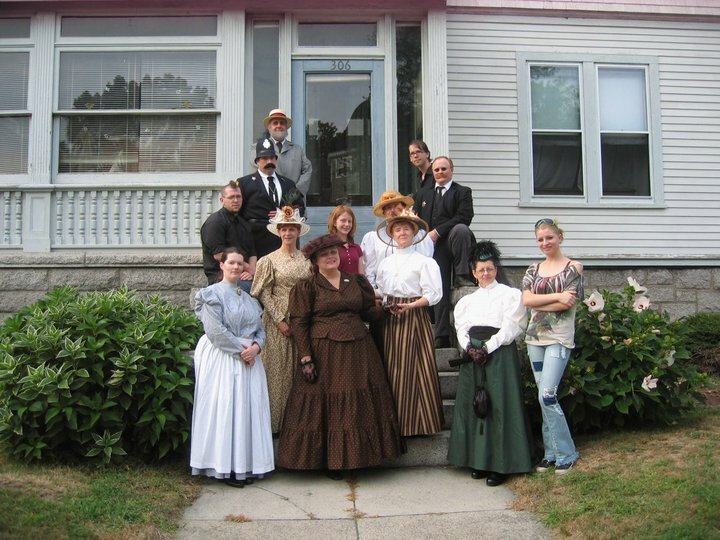 I’ve lived in Fall River all my life and have always been intriged by anything about Lizzie Borden.I reccomend this to all my friends. Keep up the great work. Thanks. Wonderfully-written narrative of this memorable trip, Shelley!